TO LIFE! 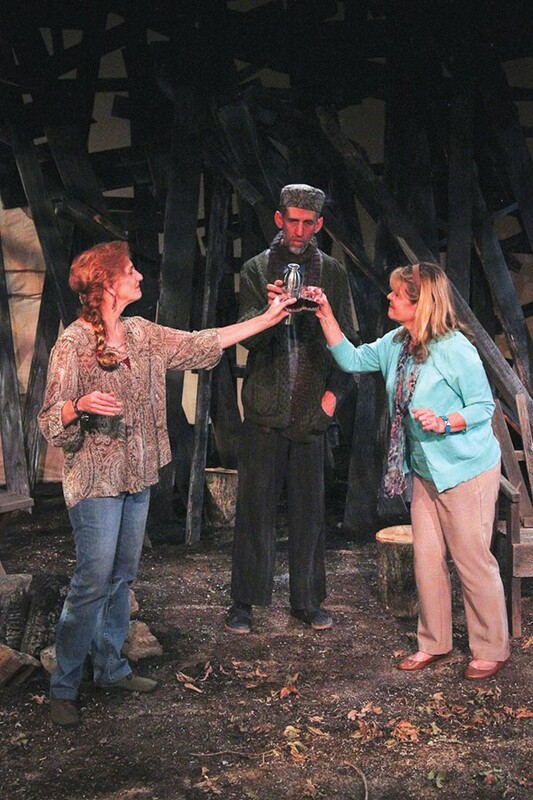 Jeannette (Elly Lichenstein, left) and Neil (James Pelican) share a toast with Dinah (Susan Gundunas). Most stories that appear to be about death and dying prove to be all about life and living. They just use the inevitability of death to cast comparative light and shadow on the many joys and pitfalls of being alive. In Jane Anderson's deliciously rich drama The Quality of Life, playing at Petaluma's Cinnabar Theater, four superb performances anchor a beautifully crafted series of alternately heavy and lighthearted discussions about death and life, culminating in a two-part climax that is at once breathtaking in its poetic simplicity and stunning in its clear-eyed wisdom. Dinah and Bill (Susan Gundunas and Richard Pallaziol), conservative Christians from the Midwest, are struggling in different ways with the brutal death of their daughter. When Dinah learns that her cousin Jeannette (Elly Lichenstein) has lost her Northern California home to a wildfire, and that her husband, Neil (James Pelican), is in the final stages of cancer, the straight-laced Midwesterners decide to visit their hippy-dippy in-laws. Stunned to find the Californians living blissfully in a yurt aside the skeletal remains of their house, Dinah and Bill are in for another surprise when they learn that Neil plans to take his own life in a few weeks—after one last party. What perhaps sounds depressing and heavy is anything but in Anderson's humor-filled script. The level of intellectual debate among the characters is at times exhilarating, as this mismatched foursome power through a fiery list of hot-button topics, from medical marijuana and right-to-die issues to the question of whether God truly has a plan for our lives. The unusual set, by Nina Ball, is truly impressive—all blackened timber at crazy angles on a patch of dirt complete with campfire. The lighting by Jon Tracy effectively gives a sense of time, from early morning to late evening. Taylor Korobow's sensitive direction is unfussy and clean, focusing on building intensity through the ever-shifting relationships of the all-too-human characters. An unnecessary opening sequence set to Bob Dylan's "Not Dark Yet" mainly serves to delay the action. Once in gear, though, Korobow and her excellent cast deliver a gripping, moving, funny and life-affirming examination of the ways that death, ironically enough, has ways to remind us that life, for all its shocks and snares and unhappy twists, really is worth living, and savoring, right to the end.